With its reddish bark and its evergreen leaves, you would be forgiven for thinking that the Strawberry tree was some kind of exotic tree from the tropics. Well, it may look exotic, but it is in fact thought to be a native; it is certainly native to Ireland; some experts believe that it may even have survived the ice age. 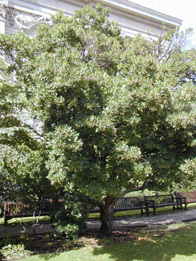 It has windy branches and small leathery leaves, not unlike those of the bay laurel, but the thing about it which is most striking, apart from its bark, is its fruit, and it is to this fruit that it owes its name; because they are not dissimilar in shape, and the texture of their skin, to small strawberries. They can be seen on the tree all year around, but if you are lucky you might see them when they are red; this can happen quite late in the autumn, November and December. They are edible and not unpleasant. 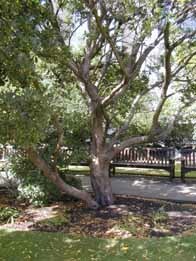 alternate; veins: alternate; leathery, evergreen; narrow, pointed. nuts/fruit: look like strawberries; all year around, but are only red late in the year November-December. not conspicuous; pinkish/white clusters that hang down; September-December. grows to 10 metres; windy, shrubb like. general: thought to be a native tree that may have survived the ice-age; native to Ireland, fairly rare, though there are some in Seething Gardens. Shown in red on the map.